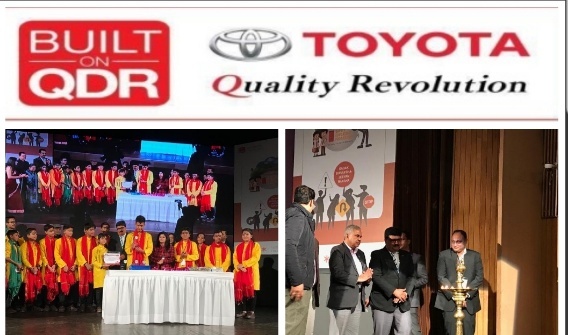 New Delhi: Reiterating its strong commitment towards Road Safety, Toyota Kirloskar Motor, today organized a national platform on road safety for the state level winners with an aim to evaluate the real-time learnings and applications by the students. ‘Toyota Safety Education Program’ (TSEP) is an interactive learning program targeted at school children between the age group of 10-14 years educating them on the importance of road safety through a phase-wise approach. This unique program is aimed at enhancing the level of awareness and instill responsible behavior amongst school children on road safety. Toyota aims at inculcating the road safety culture in school children from class 5th to 9th through various methodologies like classroom sessions and practical demonstrations. The awareness and behavioral change are evaluated through various competitions namely quiz, project work and skit performances. The event was graced by Mr. Eish Singhal, Deputy Commissioner of Police – Delhi Traffic Police; Mr. Ramdeep Choudhary, Deputy Secretary (MoRTH), Mr. Kamal Singh, Executive Director – UNGCNI [UN Global Compact Network India] in the presence of the senior representative from Toyota Kirloskar Motor, Mr. Naveen Soni, Vice President. The Toyota Safety Education Programme – TSEP was initiated in 2007 followed by the new module roll-out in 2008 through a national launch across Delhi, Mumbai, Bangalore. The new TSEP module is focused on bringing in attitudinal change amongst school children. It is a step wise approach, a slow introduction of the concept to school children aiming for better retention of the awareness on important aspects of road safety. The program is an age group wise distribution of the know – how on road safety to children [Grade 5th – 8th]. Specific to Grade 9, the students are encouraged to take up project-based activities [on voluntarily basis] well-guided by teachers with an aim to educate the general public on road safety. As a part of the learning program, children are engaged in mimes, slogan writing, drawing competition, class room sessions, quiz competitions, manning traffic junctions, teaching the learnings of TSEP to the junior class children and nearby schools. The emphasis is to demonstrate the projects on road safety in various platforms like parents – teacher meet, school assembly, public areas. All these activities are undertaken under the active leadership of the respective teachers from the school under the guidance of Toyota and implementing partner. Through these various measures, Toyota aims to influence the general public and the families of the children, setting an example through the actions of younger safety ambassadors. Safety rules to be followed while using public transport or school bus. *According to a recent study conducted by the Ministry of Road Transport and Highways, road accidents claimed 1,50,000 lives during 2018 in India and 400 deaths every day on Indian roads, which further translates into 57 accidents and loss of 17 lives every hour [on an average] in our country. [*Source: MoRTH]. Expressing his views on this occasion, Mr. Naveen Soni, Vice President of Toyota Kirloskar Motor, said, “We are happy to see such enthusiasm and participation among school children. Through these fun and innovative sessions, our endeavor is to inculcate the safety concept in the young minds. We, at Toyota, believe that Education is the most effective way to bring in a constructive change in the society. Being safety leader, we strive to ensure safety of every road user be it driver or pedestrian. As we believe, children are the future of our country, our aim is to develop them to be the ‘Road Safety Ambassadors’ & advocate the safety cause to tackle one of the grave national issues. Our key objective is to bring a self-transformation amongst the school children by raising safety awareness through this TSEP program and at the same time bring in a large societal change through their safe actions at road. Being a responsible auto manufacturer, our focus is not only on manufacturing safe cars, but also to bring positive behavioural change in the society towards safe road practices. Our safety approach being 3-dimensional, focuses towards Safer Cars-Safe Driving-Safe Environment. We acknowledge the support from the Traffic Police and Schools for their dedicated support towards this road safety campaign”. He added. Safety has been the DNA of Toyota and of prime importance. TKM adopts a holistic safety approach – Manufacturing Safe Cars, Developing Safe Drivers & Building Safer Environment. – TKM conducted Driver Training Programs & Health Check-Up Camps for Airport taxi drivers in Hyderabad, Bangalore and Delhi International Airport since 2014, on road safety awareness with over 5,000 drivers participating in the campaign till date. Through this initiative Toyota aims at creating a strong road safety sense amongst the drivers and encourage them to adopt safer driving practices. Safest Cars: The recently launched Toyota Yaris is the first car in its segment to offer 7 SRS airbags – (D+P airbags, Side airbags, Curtain Shield Airbags (CSA) and knee airbag) across all its variants. Combined with other best- in-class safety features such as Anti-Lock Braking System (ABS) with Electronic Brake Distribution (EBD), Vehicle Stability Control, Hill Start Assist control & ISOFIX Child Seats, we yet again set new safety benchmark in the Indian car industry. Testament to its unbeaten safety features, Toyota Yaris recently received 5-star safety ratings from the New Car Assessment Program for Southeast Asian Countries (ASEAN NCAP). Safer Environment: Some of the company’s CSR interventions, engages its employees – voluntarily contributing to the cause of Road Safety [under one of its key CSR pillars]. Under its recent road safety initiative, the employees built basic road safety requirements in prime road junctions of Bangalore city with a view to avoid road related risks as a preventive measure by enabling good road infrastructure through installation of road safety – Sign Boards, Solar Blinkers, Cat Eyes Reflectors, Convex Mirrors at turns, etc. Also, clean-up of flyover cross junctions also contributed to enhanced safety for the road users under ICARE program. Toyota remains committed as Safety Leader and will continues its safety journey to become the most admired company by offerings best-in-class safety technology through its products and further promote safety culture in the society via varied road safety campaigns in the nation. Toyota Kirloskar Motor, through its varied CSR projects, has touched more than 11,00,000 lives until now. Toyota further aims to continue its CSR journey through sustainable and scalable measures for the development of socio-economic stature of the society & make a difference in each one’s well-being. Products Innova, Fortuner manufactured in India.